Home » Health » Lime Essential Oil Benefits: Fight Cancer, Soothe Inflammation, Boost Mood and More! Like many citrus essential oils, lime essential oil benefits are perfect to help many symptoms. From reducing belly fat and preventing dental cavities to helping your anxious child get a good night’s sleep there’s a lot to enjoy! How can you use the essence of lime to improve your wellness? Here is your categorized discussion of some of lime’s amazing health benefits. What Major Health Concerns does Lime Essential Oil Help With? What are the Historic Uses of Lime? Is there a Downside to Using Lime Essential Oils? Lime essential oil is known to be high in the d-limonene compounds that rat studies show can help with stress. It is difficult to be in the moment when the cares of the day will not leave your mind and body. We hold onto concerns and tensions, unfortunately, ending up with less connection and more stress- related health concerns. See one of my favorite emotional detoxification blends which includes the uplifting spark of lime essential oil! Lime essential oil eases stressful transitions. Studies show pressed oil reduces muscle spasms so it’s worth asking what benefits the essential oil may show in future studies on this topic. How Does Lime Essential Oil Energize and Improve Mood? Lime essential oil is an energizing essential oil, like many of the citrus family. In fact, you could combine lime and peppermint essential oils into a room spray to boost mood, energy, and concentration. Try mixing 10 drops of each in a 2 oz. spray bottle and top off the rest with 190-proof alcohol. The perfect afternoon pick-me-up spray! 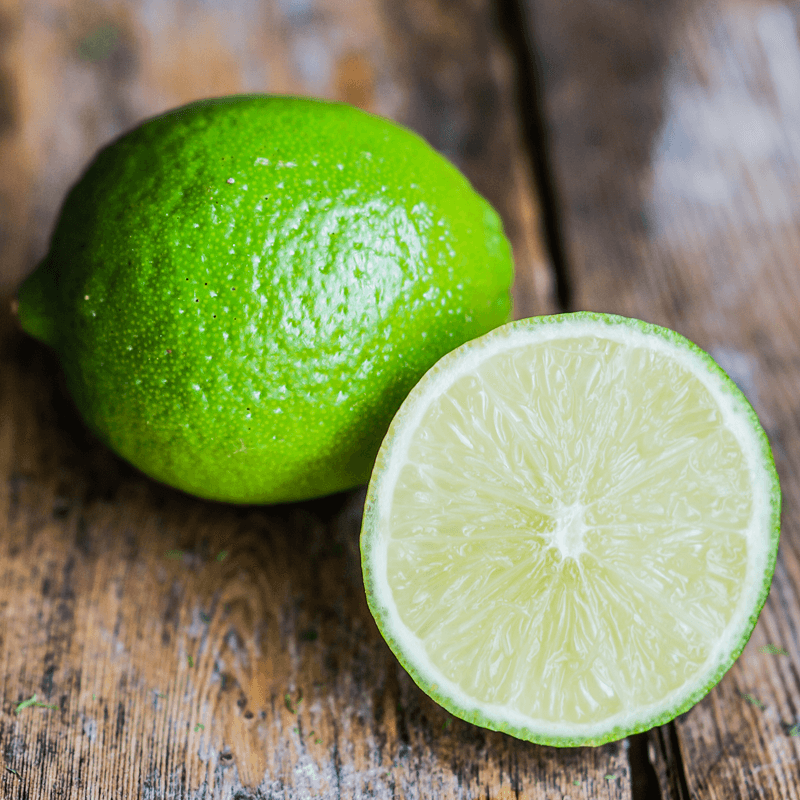 This study shows the benefits of lime juice in energizing you, and we look forward to more studies on the benefits of lime essential oil. It may also improve energy and focus without the jittery feelings caused by drinking too much caffeinated coffee, tea, or soda. In fact, some people like to add a drop of high-quality essential oils (safe to take internally) like lime or key lime solubilized in a refreshing drink to replace caffeinated drinks while driving. Learn more about safely solubilizing essential oils in water Learn more about how to disperse and dilute essential oils in our guide. Dental caries or cavities are caused by a specific group of oral bacteria that are difficult to control—even with great dental hygiene practices. Researchers found that the best anti-cavity preparation they tested, including several fluoride products and even chlorhexidine (which is too toxic for daily use) was a garlic and lime juice solution. You know how much we love garlic here! Lime essential oil is extremely effective at fighting bacteria in general and oral bacteria, specifically. We recommend it in our essential oil oral health mouthwash for this reason! You’ve probably seen the recommendations to drink fresh lemon or lime beverages to help lose weight. But lime essential oil is an even more concentrated, and, though it has a different chemical profile than the juice, may contribute to weight-loss efforts as well. It’s one of my seven top essential oils for weight loss support! This means, one of our our favorite essential oil roll-ons not only treats visible signs of aging, but some of the physical deterioration as well if it is caused by oxidative stress. And of course the antimicrobial benefits makes it great for healthy homemade deodorants and other body-care recipes! Lime essential oil doesn’t just benefit sleep concerns and mild anxiety. Studies are showing health benefits and healing support for major medical issues too! Isn’t God amazing? Essential Oils And Cancer See more of our tips for using essential oils while battling cancer in this important article! Fatty liver disease (even the type caused by stress) is greatly improved by taking limonene found in lime essential oil and other citrus oils. Research confirms that limonene helps insulin resistance and liver injury that is caused by stress and an unhealthy diet. Alzheimer’s Disease. This is a devastating diagnosis as the personality of the patient slowly fades away. It’s something that has touched our family personally. Essential oils for Alzheimer’s patients provide promising treatment options. Lime essential oil may help by inhibiting cholinesterase, an enzyme responsible for damaging neurotransmitters in the brain and with it’s high antioxidant levels. Heart Disease. Citrus consumption, including lime, may also have a direct impact on the incidence of heart disease. How much of this benefit translates to lime essential oil is something future studies will need to show, but lime essential oil shouldn’t be ruled out. When dietary and lifestyle changes can protect your heart, why take chances—try to add some citrus, whether from diffused oil, fresh fruit, or refreshing citrus water, every day. Diabetes and Heart Disease Relief with Essential Oils See additional ways we use essential oils to help with diabetes and heart disease. Gallstones.The limonene present in lime essential oil is responsible for an impressive 48% success rate when used to dissolve gallstones in this trial. Others found partial dissolution. While gallstones may not seem as life threatening as heart disease or cancer, they are reportedly among the most painful of medical disorders, and if they cause a rupture, are just as dangerous. Some European countries report similar success with peppermint essential oil, and European doctors rarely remove a gallbladder from an otherwise healthy patient. The trial above injected the oil directly so it’s not the same as topical application but the results are interesting. Limes were used throughout history in a variety of ways. It’s interesting to look back and see how the benefits of lime essential oil were hinted at throughout historic uses! While they used lime fruit because of the lack of modern distilling methods, it’s a fun peek nonetheless. There is a lot of buzz in the essential oil world regarding photosensitivity of skin after using citrus oils. It is true that expressed citrus oils can cause you to be very susceptible to sunburn for hours after application, and they are really only appropriate for products that are well diluted, used in the evening, and washed off in the morning (or that are used on completely unexposed skin). However, steam distilled citrus oils do not cause ultraviolet light sensitivity. Even pressed oils are typically safe if they are used in appropriate concentrations and diluted with care and common sense. See more about citrus essential oils and photosensity here! The GRAS is always greener… the GRAS designation means that upon inspection for safety, a product or ingredient is Generally Recognized As Safe. Steam distilled, fresh lime essential oil received the GRAS designation. Remember, we recommend diluting essential oils appropriately for maximum safety. Additionally, most carrier oils help the essential oil penetrate and stick to skin for more effective use. Citrus oils like lime may deteriorate with time, ultra violet light exposure, and oxygen exposure. It’s best to buy smaller quantities you will use up fairly quickly. Lime essential oil makes a great gift, especially if you include a card with fun and healthy ideas for how to use it!